state? The answer is Artfulness. 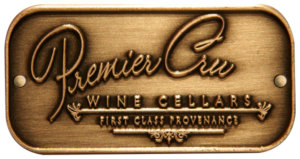 This is perhaps the easiest way to describe Premier Cru Wine Cellars and what drives its owner, Paul LaRussa to create art in the spaces in which people love to store their wine. While some companies build cellars, LaRussa builds concept and stirs our senses with his use of space and structural design. Paul LaRussa studies the Burgundy expression from his Premier CruCollection Stemware. “Before Paul even got to the wine cellar he stopped in awe of our sprawling, arms-out oak tree and said ‘We’re using that’. I didn’t know what that meant and I have to admit I felt a mixture of excitement and trepidation so I hired him on the spot.” LaRussa had no intentions of altering the magnificent tree. Instead he installed a large window in the cellar. Yes, you read it right. A window. In a wine cellar. A big window. Perhaps it’s also LaRussa’s very approach to his work that sets him worlds apart from cellar makers. It might seem strange, but his success could be largely attributed to the fact that he doesn’t begin each project obsessed with “what pleases most clients” as a priority. Instead, he allows inspiration to come from the space with which he is working, and the creative form which grows organically from that. 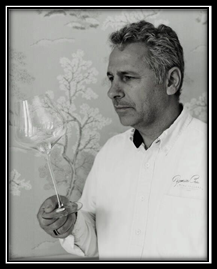 As a vinophile himself, he already exists within the world of wine lovers. Achieving the potential of the space is LaRussa’s goal. He’s not interested in selling preconceived, one-fits-all hardware which represents the business model for the vast majority of cellar makers. The tree concept proved to be a huge success, but that’s not Gaal’s favorite element of the cellar. Nor are the striking oak-barrel floorboards or the cleverly optimized use of space. The honor for favorite feature goes to the door! “It’s a masterpiece,” she says. Gaal herself is a stained-glass and mosaic artist. “I wanted something worthy of the term aesthetically surprising. That’s important to me,” she explains. in her favorite place – the cellar he built for her. The one-hundred percent handcrafted door was created with over 500 pieces of wood to capture the upper expression of this visual artwork. The entire door is completely handcrafted with Knotty Alder and finished with proprietary means to acquire the warmth and finish. If the Bauhaus era, which coupled framed art with tubular furniture, influenced home and office furniture around the world; and if its cubism gave birth to Tupperware’s design, then it is understandable that LaRussa is seen by his wine-industry peers as a pioneer in structure and creative design. Innovation in its most exquisite form meets practicality in its most optimized variety. LaRussa is leading the charge to create private meccas where our memories, nostalgia, long-awaited arrivals and prized acquisitions in the form of wine bottles, lay wait for their opening day. 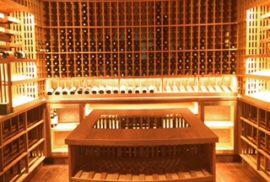 In a LaRussa cellar, your collection will dwell in a stunning environment where detailed and original craftsmanship is honed to evoke feelings of “something exceptional”. On entering one of LaRussa’s cellars, you can’t help but feel you are somewhere special and that the cellar you’re in says everything about its owner. A short drive across town to Pacific Palisades and a cellar of a different nature proves small is beautiful too. In the flawless home of Doreen Leeds, one can behold this unimposing yet completely arresting cellar – the possibility of which is electrifying. After all, many reading this have room for a cellar of this size. (74”d x 58”w). Could we too have a Paul LaRussa original? flawless lines and optimized use of space. Sure. If it were that easy…all cellar makers would do it!